2019 Matveev V.V. Cell theory, intrinsically disordered proteins, and the physics of the origin of life. 2017 Matveev V.V. Comparison of fundamental physical properties of the model cells (protocells) and the living cells reveals the need in protophysiology. International Journal of Astrobiology, 16(1): 97–104. 2010 Matveev V.V. Native aggregation as a cause of origin of temporary cellular structures needed for all forms of cellular activity, signaling and transformations. Theoretical Biology and Medical Modelling. 2010, 7:19. 2005 Matveev V.V. Protoreaction of protoplasm. Cell Mol Biol (Noisy-le-grand). 2005;51(8):715-23. 2005 Matveev V.V, Wheatley D.N. "Fathers" and "sons" of theories in cell physiology: the membrane theory. Cell Mol Biol (Noisy-le-grand). 2005;51(8):797-801. 2000 Matveev V.V. Evidence of a new type of protein-protein interaction: desensitized actomyosin blocks Ca2+-sensitivity of the natural one. A possible model for an intracellular signalling system related to actin filaments. Physiol Chem Phys Med NMR. 2000;32(2):167-78. 2017 Vladimir Matveev. The new instrument of communication in science: a multimedia format of articles. The example prepared from my article "Comparison of fundamental physical properties of the model cells...": [YouTube] [PPTX]. 2016 Владимир Матвеев. Основной вопрос науки о происхождении жизни: мембрана или фаза? Доклад на 2-ой Всероссийской конференции по астробиологии: «Жизнь во Вселенной: физические, химические и биологические аспекты». Пущино, 5-9 июня 2016 г. Видео [Youtube], слайды [PDF], тезисы [PDF]. 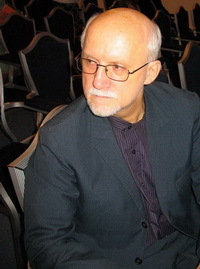 Vladimir Matveev. The great basic question of science: Membrane compartment or non-membrane phase compartment is a physical basis for origin of life? Oral presentation at The 2nd All-Russian Conference on Astrobiology. Moscow, Pushchino, 5-9 June 2016. Video in English [Youtube]. Presentation slides in English [PDF]. Comments for slides in English [PDF]. 2014 Матвеев В.В. Четыре фундаментальных свойства живой клетки и проблема происхождения жизни. Доклад на международной конференция "Проблема происхождения жизни". Москва, 22-26 сентября 2014 г. Видео [Youtube], слайды [PDF], тезисы [PDF]. 2006 Отцы и дети в физиологии клетки. Химия и жизнь, № 4. 1994 Революция в физиологии клетки? Химия и жизнь, № 8. 1988 Теории и факты. Химия и жизнь, № 7. My educational project "Against method"
Мой образовательный проект "Против методологического принуждения"